There are very few retailers out there with fans that are willing to drive 50+ miles and plan their whole day around a store visit. 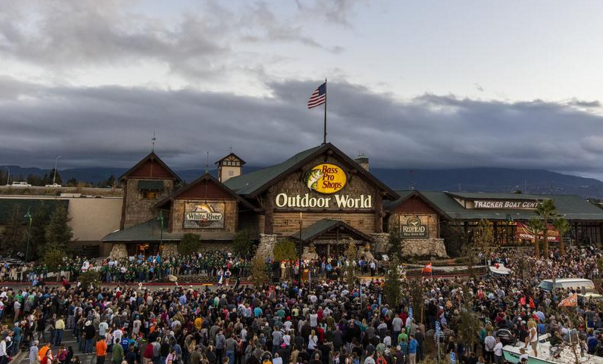 Bass Pro Shops is on that short list. They officially opened their San Jose store on Almaden Expressway a couple weeks ago, which is the only one in the Bay Area and the fourth in all of California. About 10,000 people came for the grand opening. The San Jose store is larger than an average Costco at 145,000 SQFT. It features a huge array of camping, hunting, fishing, boating, and general outdoor gear. If that wasn't enough, it has its own 12-lane underwater-themed bowling alley, a seafood restaurant, a full bar, an indoor archery range, and a 15,000 gallon aquarium worthy of a zoo. The store employs over 200 people. Bass Pro Shops is located at 5160 Cherry Avenue and is open Monday through Saturday from 9am to 9pm and Sunday from 10am to 8pm.